Besides running his ubiquitous e-tailer, Amazon CEO Jeff Bezos is also the founder of the spaceflight company Blue Origin. He was an honoree this past Thursday night at the Smithsonian Magazine American Ingenuity Awards, where he received the Technology award. 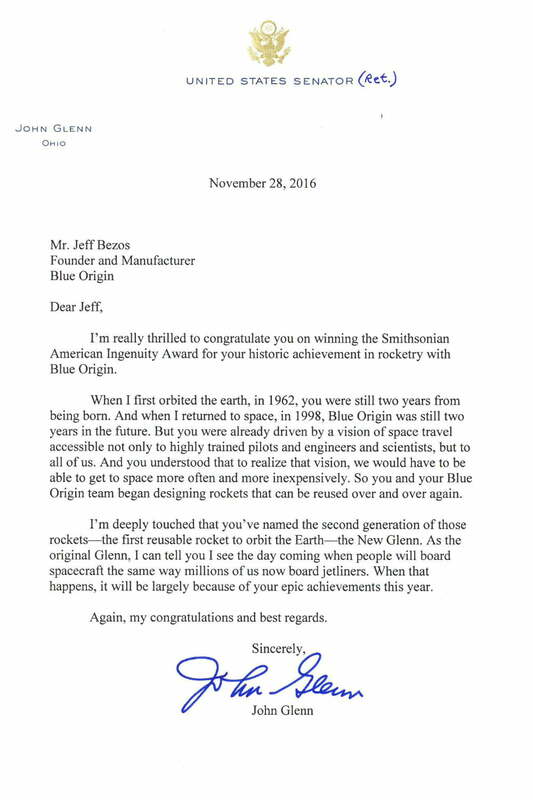 It was presented to him for Blue Origin’s efforts in creating a reusable rocket, according to The Verge. Bezos also received another memento, one that could arguably be more cherished. It turns out that John Glenn, the first man to orbit the earth, had written him a letter on November 28, and it was also presented to the Amazon CEO that night, the day that the 95-year-old astronaut died. Business Insider reports that Glenn had originally been scheduled to attend the dinner, but couldn’t do so due to the health issues that he would eventually succumb to. His fellow astronaut (and the first African American woman in space) Mae Jemison read the letter to the assembled audience, which you can watch above. Bezos has already announced he was going to name the next-generation Blue Origin rocket “New Glenn,” after one of his boyhood idols. Yahoo Finance says the 313-foot tall rocket should lift off before 2020. A previous Blue Origin effort, “New Shepherd,” was named after astronaut Alan Shepherd, who was part of the Mercury 7 crew along with Glenn. In the letter, which was framed and presented to Bezos, the late astronaut pioneer wrote, “When I first orbited the earth in 1962, you were still two years from being born.” He went on to add that people should soon begin boarding spacecraft the way they board airplanes. “When that happens, it will be largely because of your epic achievements this year,” he concluded. Thank you, John Glenn. Godspeed.